Yeah, I was excited to say the least. Practice started at 10am, so I wanted to get away quickly, I just had to quietly encourage Leona to wake up. I wasn’t as subtle as I intended so she wasn’t pleased. Oops! She went to shower so I went to reception to make use of the wi-fi. Had a look on twitter to see what was up and seen some work related crap that was posted on Facebook, which temporarily pissed me off, for like 2 seconds, then I remembered I was going to Practice! Yay! Packed a few bottles of water and lifted a few muffins etc from the hostel breakfast buffet and headed to Universitat metro station. Got to Sants Estació station and took a wrong turn on the way to the main train station part and ended up outside and across the road (!). Went back into the train station got our tickets and looked at the giant screen to find out where we were going. 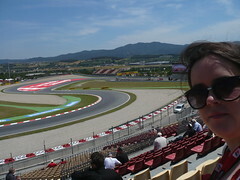 There was far too much information on the screen so I asked an official looking man “¿Montmelo?” (I finally got it right! ), he replied “catorce”. He smiled as he watched me count “once,doce, trece, catorce” into myself and I realised it was fourteen. Saw a screen saying Granollers-Centre leaving in two minutes so we ran down the escalator. Got to the platform to see a double decker train (a double decker train! Wow!) and jumped on. Just in time too, as thirty seconds or so later it pulled away! The train was packed too, mainly with people in F1 related clothing. It stopped in two other stations in Barcelona (Passeig de Gràcia and Clot) and it got even more full! So going to Sants was the best thing to do! 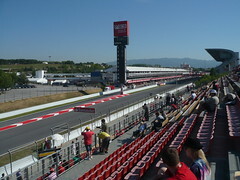 Got to Montmelo and there was no sign of the shuttle bus service mentioned on the Circuit website. This was grim, as my legs and back were still sore from all the previous days walking. Walked through the town at a leisurely pace and as I passed the stall with the €5 hats. 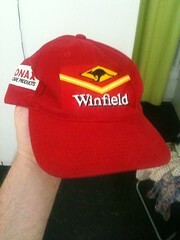 I purchased the retro Williams hat, from the day before. As a Ferrari fan I was also tempted by the white Raikkionen Ferrari hat, sadly it was rotten dirty so I gave it a miss! Also seen a stall which were selling ING Renault hats both (Alonso and Piquet ones) for €5 which found surprisingly cheap. Stopped at the shop to pick up a few snacks and bottles of water, and then headed towards the circuit. 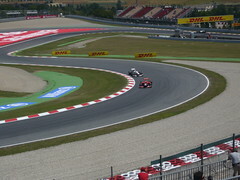 We got close to the circuit and then I started to hear the roar of engines. Checked my phone and it had turned 10.00. Even though we were still on the road the cars were loud! We got into the circuit and just headed for Grandstand J, even though we could go anywhere on the circuit (Except grandstand C for some reason), we thought it would be easier as it was right beside the gate we entered and so we knew where we were sitting on Saturday and Sunday. We went to our seats that were on the ticket, and I thought it wouldn’t be as loud, a few more cars went by and I decided it was best to use my complementary earplugs provided by Formula1.com (cheers Bernie!). The view from our seats was excellent. 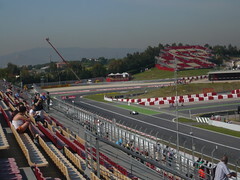 We could see the start line up to turn 1 (though we would have to stand/lean forward to get a clear view of turn 1). We could also see the exit of turn 5 to the exit of turn 8. 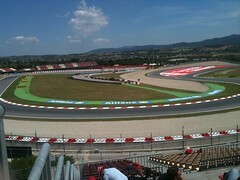 Annoyingly our view of turn 7 was blocked by a grandstand which was empty all weekend! We also had a giant screen right in front of us. For 160snoops (the cheapest grandstand tickets!) it was really good! 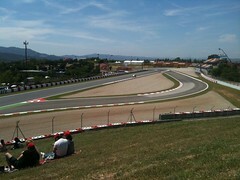 Once FP1 ended we watched a bit of the GP2 practice then decided to walk to another grandstand. Walked through the tunnel at grandstand K (under the track!) and headed to the general admission zones. 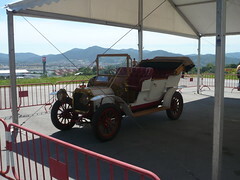 Saw a gazebo with some classic cars in it which was randomly there, still, was nice. We walked round to an embankment just after turn nine. I got a hotdog and beer for €9 (!) and sat to watch the Qualifying for the Mini Challenge. 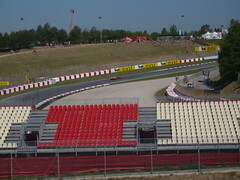 For the next F1 practice session we went to grandstand B, with the thinking we could see alot more from there (turn 10 – 15) plus it’s a more technical twisty area so the cars would be going slower. Leona went for a burger (€5.50) and didn’t like it so I finished it off (it was a good day!). I thought, as the cars wouldn’t be accelerating, my earplugs wouldn’t be needed. I was wrong, mainly due to the really loud Renault (note – at the time I didn’t know about the throttling in corners). FP2 wasn’t that eventful either (to the extent Leona fell asleep for a while, without ear plugs! How?! ), though the view was great so I was happy. When I got home I checked iPlayer to watch practice but they only had the audio. 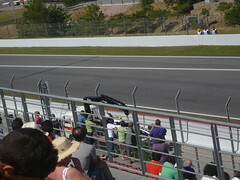 Just as well really as not much happened, but it was my first time seeing F1 cars in anger and it was awesome! 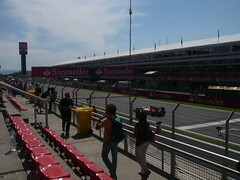 After FP2 we walked around to the main grandstand to watch a bit of the GP2 qualifying. The idea being we would sit in the shade for a bit (though we ended up not sitting in the covered part!). Before going onto the grandstand the echo behind was amazing, and it was only GP2 cars! 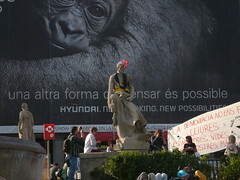 The program went on to half six but we left at about half four and headed back to Barcelona. Leona was saying she needed a hat so on our 2.5km walk to the train station I stopped at a stall to buy her a one of the Renault Alonso hats (she didn’t want a Piquet!) and we jumped on the train back to Barcelona. Back in Barcelona we sat at Pl. Catulanya for a bit. 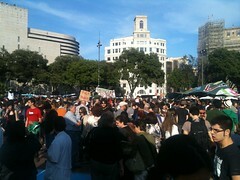 The #spanishrevoltion protest was a lot bigger than it was two days before. Watched that for a bit and walked through the crowd. We then went to some pasta place on La Rambla and had some rank lasagne which looked like it was microwaved. Walked down La Rambla a bit more and then through Mercat de Sant Josep. We decided to buy our lunch there before trekking out to Montmelo the next day. We then headed to a bar across the road from our hostel and had a few pints of Estrella for myself and Leona had some frozen dacaries (at €3.50!). 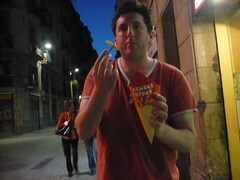 I got a portion of chips for €1 as I got some munchies and then headed for a needed kip.